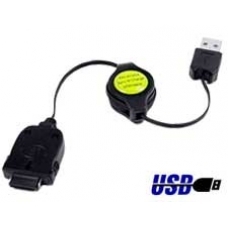 The iPAQ sync N charge USB retractable cable is an excellent replacement for the bulky Compaq iPAQ cradle and power supply. With the innovative retractable cable mechanism, you can save space and forget about carrying both the cradle and a power supply with you. The iPAQ sync N charge USB retractable cable is 100% compatible allowing for fast USB data transfer with your desktop PC while at the same time charging the iPAQ battery, At just over 4 inches in length when retracted, this is one of the smallest retractable sync N charge cables available on the market, boasting a fully extended length of nearly 40 inches giving you ample amounts of cable. This is an elegant yet simple solution for your USB sync and charge requirements, so if portability without sacrificing functionality is important this is the cable for you. * Durable, Lightweight and Compact. * Strong Ultra Thin Cabling. * Fast USB Data Transfer. * Cable is CE & UL Certified.